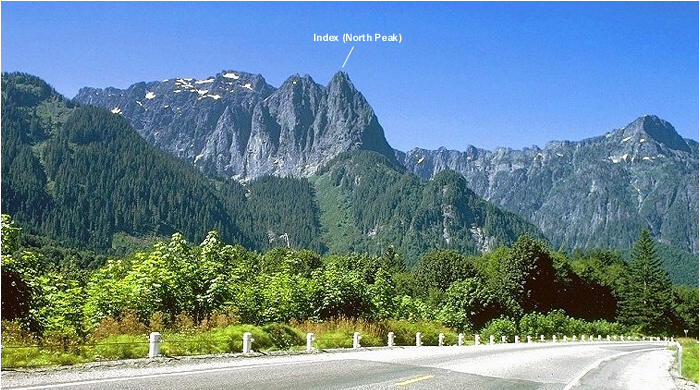 Mount Index Group as seen from hwy 2 in 1978 (image courtesy of Bob Bolton). Surrendering all hope for favorable climbing conditions north of the border this season, Eric and I resigned ourselves to climbing that pesky little sub-alpine brush-fest off of hwy 2. Yep, we finally succumbed to the allure of Mount Index’s prominent North Peak. No more would we have to tolerate the drive to and from Stevens Pass, wondering why anyone would willingly endure such a vague and brushy route only to reach the lower of Index’s three summits. That said, one could certainly traverse the three summits, and thereby truly summit the peak (in fact there’ve been numerous such ascents this year alone), but that would be a bit more than what Eric and I had in mind. We left Seattle late in the afternoon and made the short drive over to the Lake Serene Trailhead. A pleasant hike that gets somewhat steep near the end saw us to the picturesque Lake Serene. A trailhead notice advises against camping within 500 feet of the lake, but fails to suggest where else one should camp. Locating the only reasonably flat and brush-free patch of dirt directly alongside the trail, we dropped our packs and laid out our bivy sacks for a warm night among mosquitoes and shards of broken glass. Northeast Spur in morning light. Eric hikes up the talus slope. We departed camp at first light and made our way towards the obvious talus slope beneath the Northeast Spur. Following a bit of a path through thick brush, we reached the crest of the brushy spur and changed into our rock gear. Climbing up from this point, we simul-climbed about two pitches of slabby and mossy rock to reach the base of the “steep wall” mentioned in the CAG. Working left, a short pitch up a brushy gully/dihedral led to a good stance from where to belay the “exposed corner” pitch. A short dihedral led around the corner, whereupon I began working up clean rock on a small rib. Climbing the rib below the "rock bowl". I left the rock rib and traversed left across the “rock bowl” to set up a belay for Eric. Now failing to reconcile the CAG description with the features above us, we decided to continue up and left towards some slings (the CAG suggests to “cut sharply right” and look for a “hidden ledge”). Not seeing any indication of a ledge at right, I instead climbed up an increasingly steep and exposed headwall of face and crack moves (occasional pitons) to reach an uncomfortable semi-hanging two-piton belay. The wall bulged a bit above this point, with an old tat of rope tied off to a piton dangling just out of reach…a hand-line no doubt. Looking down from the airy belay. I tried and tried to pull that committing move up from the belay station, eventually taking full advantage of that ancient hand-line. This got me to an even more precarious stance, with distressingly blank and heavily lichen-covered rock above. No go! I lowered myself back down to where Eric was and began looking right for options…if I could only traverse the featureless face and get into the gully, but where to then?? We were obviously already off-route and so decided to rap back down into the rock bowl and re-gain our bearings. Our little adventure had cost us an hour; we could ill afford many more such shenanigans and expect to be off the peak before nightfall. The bivouac warning was beginning to sound like a bad omen. Index 1, Sergio/Eric 0. Eric rounds the hidden ledge. From this belay, two hideously steep jungle-climbing pitches up the gully lead to a “slanting ramp system” that traversed around the steep rib now before us. The effort of climbing these pitches, fully exposed to the intensity of the August sun, really sapped my energy. I drank liberally from the two-liters I had with me, knowing full well that I should at least have brought up twice that amount. No pro in North Gully. Squeezing between rock and trees on the narrow ramp, we traversed into the North Face bowl proper and began climbing upwards in an obvious gully. Starting out 3rd and 4th-class, the “right-curving” gully ends with two pitches of mid-fifth climbing with virtually no protection. From the top of this gully, a brushy ledge/ramp leads right to a platform below the elusive but classic North Rib. At last! This is what we came here for, right? North Rib from the belay platform. Looking down the North Rib. Climbing the two pitches of the North Rib definitely felt less intimidating than it looked from the belay platform – the 5.5 – 5.6 move is encountered on the final step visible from the platform. A final bit of exposed simul-scrambling along the top of the rib saw us to the “heather bench” beneath the false summit. Working left a bit, we located the final brushy gully, and scrambled up it for about a pitch (not two pitches as the CAG suggests) to reach the false summit. From there, the true summit of the North Peak still seemed frustratingly far away and we were now beyond our turnaround time set for 2:30pm. Northeast view over Skykomish River valley. Untying at the false summit and dropping my pack, I began a mad scramble over the second false summit, determined to bag this sucka and get back off it as fast as possible. I certainly wasn’t about to turn around now that I was so close! Eric, on the other hand, graciously opted to hang back at the first false summit and get our initial rappel set up. Middle and Main Peak of Mt. Index. With a short, but loose traverse on the right side of the crest and one steep step up from the notch below the second false summit, I hurriedly scrambled up the final heather and rock slope of the North Summit. I snapped a few quick photos, drank the last of my water, allocated all of five seconds to locate the summit register (which was nowhere to be found) and started back down. I rendezvoused with Eric at the rappel station around 3pm…and now the race against darkness begins! View of Gunn - Merchant Group at left and Mount Baring at right. After one single-rope rappel down from the false summit, we scrambled back along the North Rib to the first obvious rappel station (the route is festooned with rap slings). Three rappels brought us down to the brushy ledge/ramp above the North Face gully. The first rappel down the gully deposited us in a small alcove with only a suspect-looking horn from which to rappel from next. Eric responsibly hammered a sacrificial nut to back-up the horn and we were off rappelling again. Two more raps saw us to easy scrambling terrain near the bottom of the gully. Traversing back across the ramp we found ourselves back above the nasty jungle pitches dreading the prospect of having to rappel back down through the brush. Fortunately, after a most annoying half-pitch rappel, Eric located an existing rap station below in a rock bowl at right (upper portion of “rock bowl” mentioned earlier in this report). We rapped down to this rap station and made two more rappels to reach the same rock bowl from earlier. From there, we easily rapped the route back to where we stashed our boots on the Northeast Spur. We started hiking back down to Lake Serene, with me taking a wrong turn somewhere and needlessly flailing in the brush for about ten minutes…it seems the mountain wasn’t quite through with me yet! Back at the lake around 9PM, I found Eric filtering water into his Nalgene bottle. Ugh…we still had to work for our water. With my last sip of water over five hours ago, I drank and drank…so much that it hurt, and then I drank some more. We packed up and started down the trail around 10PM, losing about a half-hour second guessing ourselves and wandering aimlessly in the dark and on the wrong trail/road. Were it not for the one other person returning from the lake that night showing us the way, we’d probably still be lost today. Back at the car by midnight and back home sometime around last call. Goodnight!